I love RPG maps as a concept, but I have a tendency to shy away from them for settings I produce. I like the vagueness that comes with the lack of a map. But at the same time, damn if the old “Known World” maps and such just set my mind to racing. So, with a little help from map tools by the inimitable Dan Proctor and the incomparable harmyn, I decided to knock together this thing over here on the right side of the screen. 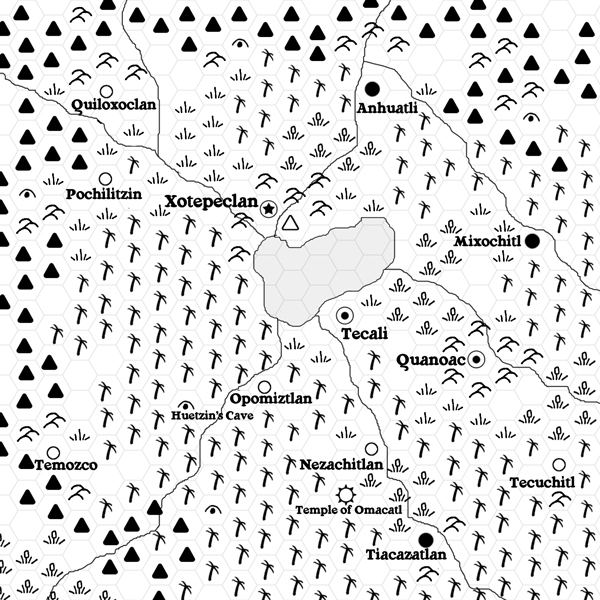 Yep, it’s an honest-to-goodness attempt to map out Tlactoztlan based on the bits and pieces that have been revealed in the various writeups I’ve done on that setting. This is probably not final, and it certainly shouldn’t be taken as any kind of canon. Or rather, I utterly and completely reserve the right to blow this up and replace it with something else entirely. Or at least refine it if I ever get on the stick and produce anything for distribution beyond the confines of the blog. This entry was posted in Barbarians of Lemuria, Maps, Tlactoztlan on October 18, 2010 by the venomous pao. This takes me back to the wonderful campaign map from the Isle of Dread. 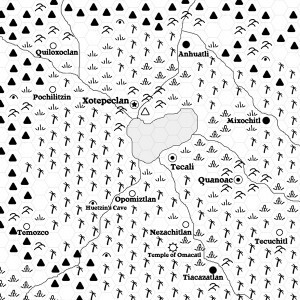 Is that white mountain icon next to the city of Xotepeclan a non-active volcano? You caught me on both counts, amigo 🙂 Isle of Dread was definitely sitting on my shoulder while I was working on this map and absolutely that’s a dormant volcano. It’ll wind up with a name before we’re done, too! Groovy. Glad you dig, amigo. I’ve found myself with a lot more free time lately and I think I may just drive forward with putting enough work into this to make it something I really could publish. Maybe more of a chapbook/’zine than a full-sized supplement, but something that could be done up right all the same. Sing out if you ever want any help. Anything at all. I’m moving city and changing job and that means, at least for six months, I’ll be on my own- and looking for something to keep me occupied. Hmm, trying to swap my wife for a game… That’s a new one..
Whoah, hey, that’s some big news there, Gobbo. Where ya headed? I hope the switcheroo is all good stuff for you. Best of luck in the whole endeavor, too! If I really do manage to proceed on this route I’ll be sure to take you up on your kind offer of assistance, amigo. The offer of help wil stand, don’t you worry. I’m off to Sydney, which is where I’m from orginally. Really great job and I’m really excited.